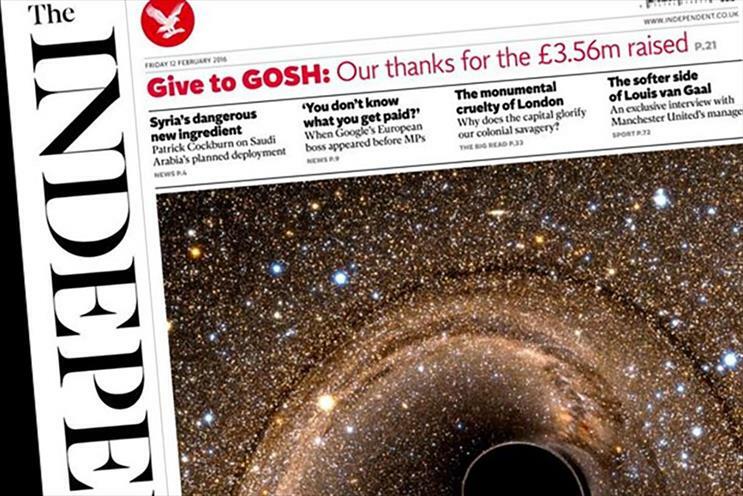 The Independent grew its overall readership by close to 50% in its first quarter as an online-only publication, as the UK national newspaper market's mobile readership exceeded its print audience. According to the National Readership Survey Padd figures for the second quarter of 2016, The Independent had a total audience of 21.1 million each month, a rise of 46% from its readership in the second quarter of 2015 figures. The majority of The Independent’s readers were on smartphone or tablet (18.2 million, up 81% year on year) with an additional 5.7 million reading the publisher’s content on PC, up 25% year on year. Jon O'Donnell, managing director of The Independent's sales house ESI Commercial, said: "We've been seeing strong numbers consistently now, demonstrating that our decision to go digital-only was absolutely the right one. As ever, the quality of our journalism is key and figures would suggest that as the big stories break more and more people are coming to us. "Our future lies very much in the pure-play news space and already we are the biggest player in the UK at more than twice the size of Buzzfeed. We are the fastest growing quality news site out there and our innovative and pioneering spirit is at the heart of this success." The Sun’s audience continued to benefit from the News UK tabloid taking down its online paywall in November. It reported a monthly readership of 13.5 million, up 5% year on year despite its print audience falling by 8% year on year, the steepest decline of any of the newspapers measured. The Sun’s PC readership increased by 148% during the period and its mobile reach expand by 65%. Today’s figures combine the average monthly audience for print between July 2015 and June 2016 with comScore measurements of titles' PC audience in June 2016 and estimates for their mobile reach. Many of the UK national newspapers reported healthy boosts to their overall readership, including The Daily Telegraph and Telegraph.co.uk (+26%), The Guardian and Theguardian.com (+20%), Daily Star and Dailystar.co.uk (+24%) and Daily Express and Express.co.uk (+42%). Tim Radcliffe, head of publishing and radio trading at Dentsu Aegis Network’s Amplifi, said: "Newsbrands are showing a significant growth in audience driven by mobile access. Naturally, the current political and economic climate has helped drive people to the trusted sources of news. Mobile growth has been helped by access through Facebook Instant Articles." The newsbrands market reached an average 47.7 million people every month during the period, up 2% year on year driven by an 11% growth in mobile. The market’s print readership declined by 3% and PC fell 1%. The NRS figures are published by the Publishers Audience Measurement Company (PAMCo), the company the newspaper and magazine industry set up last year to create a new cross-platform measurement system due to launch towards the end of next year.